BOCA RATON, Fla., April 6, 2018 /PRNewswire/ — MobileHelp® Healthcare, a leader in personal and enterprise healthcare technology solutions, today announced a new partnership with American Well, the leading U.S. telehealth provider that connects millions of consumers with care professionals through video consults, to deliver virtual care solutions to patients. Through this partnership, MobileHelp Healthcare will embed American Well’s consumer offering, Amwell®, into its MobileHelp Touch platform, giving users the capability to better manage their health through direct video or voice connection to healthcare providers in their state. In addition to providing retail customers with access to American Well services, the new partnership allows providers and payers to deliver American Well services more conveniently, with the potential to treat a variety of health conditions in the home, rather than through more expensive in-patient settings. 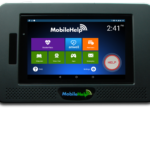 The partnership will bring telehealth service into the MobileHelp Touch base station. MobileHelp Touch connects wirelessly to an ecosystem of devices, such as a blood pressure monitor, pulse oximeter, weight scale and glucometer. The new Amwell service is designed to support patients as they are monitored through clinical oversight or as they are self-monitoring their own vital signs. One of the key features of this partnership is the patient’s ability to share data with and receive personalized advice from healthcare professionals. By connecting consumers directly with providers, American Well provides the secure, on-demand video connection to a relevant healthcare professional (pediatrician, adult medical doctor or mental health specialist) online or via mobile phone, 24 hours a day, 7 days a week. For the service, consumers will pay a fee, which differs by care professional type and consultation duration, but offers the advantage of saving time and the cost of an ER or clinically-based visit. The Amwell services will be available via MobileHelp Touch at the end of Q2 2018. Florida-based Telehealth Options, LLC served as a broker in the partnership between American Well and MobileHelp Healthcare. For more information about MobileHelp Healthcare, please call 1-561-981-6981 or visit the company website at www.mobilehelphealthcare.com.